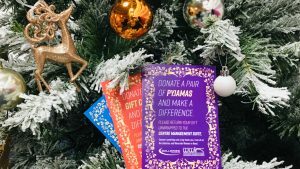 Each year our shoppers support Wearside Women in Need with gift donations to support local families who have had to leave their homes due to domestic violence. “We are always humbled by the huge support we receive from the community to help us support women and children in Wearside, and there has never been a greater need than right now. Sadly, domestic abuse appears to be more prevalent than ever and our services are under great pressure to meet the rising demand. “This year we are asking people to be as practical as possible when thinking about ‘Giving’ – gifts are a lovely gesture, but we struggle to keep our refuges well equipped and to provide emergency supplies for families in great need with very practical goods. So here it is. Merry Christmas… But not everyone is having fun. At a time of great joy where families come together, sadly some are falling apart. With your help, we want to support Wearside Women in Need so that local families can start putting their lives back together. To do this we would like you to read the stories below and on our display in Wessington Square and choose what you’d like to donate. From PJs and toiletries for girls, boys and mams of all ages, Galleries gift cards or a pay as you go mobile phone, we’ll create a Christmas Eve box to help share a little festive magic this year. Please hand in your unwrapped gift at the Customer Service Pod. Thank you. A phone can save many lives. I was married with two grown up sons at the time Wearside Women in Need came to my house with the police. My husband smashed up my house, pushed me to the ground and put his foot on my neck. It wasn’t the first time but this time my eldest son had seen enough and he rang the police. My Husband took off after smashing my son’s mobile phone – I was never allowed one! I was terrified he would come back. The charity gave me a pay as you go mobile phone and programmed police’s and Wearside Women in Need’s numbers in so at least, if when everyone had gone he returned, me and my son had a way of getting help. Just that one thing that night made me feel able to work with people to keep safe. I have since learnt that abusive partners commonly smash mobile phones to stop women from getting help. Without mine I don’t know what would have happened if the police did not arrest him and lock him up. Did you know: You can buy a PAYG mobile phone from under £10. Give a voucher and the gift of choice. I am 15 years old and had to stay in a refuge with my Mam and four younger sisters. When we left our home we had to leave most of our things behind as my Mam’s boyfriend would not let us take them. Last Christmas I received some gift cards from the Giving Tree at the Galleries. It meant I could choose my own present so I bought some new headphones, just like the ones I had to leave behind. That was the best feeling, being able to block out the sound of my noisy sisters, and it gave me back a bit of what I had to leave behind. Did you know: You can buy gift cards from £5 from Centre Management, first floor opposite Natwest. We try to keep Christmas as normal as possible for families. Children may live in a different house and worry that Santa won’t know where they live anymore or forget them. It is important for mams to be able to keep traditions alive while building new memories with their families in a safe environment free from abuse. That’s why bath time new PJs (including for mam), a toy or a Christmas eve movie with hot chocolate followed a bed time story is something we would like to keep alive. It adds to the excitement and anticipation of Santa’s arrival. Did you know: Leaving home with nothing but the clothes you are wearing means something simple like a new set of pyjamas is a treat. For every pair of PJs we receive we’ll donate a book.